The San Diego Chargers were established with seven other American Football League teams in 1959. In 1960, the Chargers began AFL play in Los Angeles. The Chargers’ original owner was hotel heir Barron Hilton, son of Hilton Hotels founder Conrad Hilton. Spanos announced the relocation in a letter to Chargers fans posted to the team’s official site on January 12, 2017. Revealing a new marketing logo with the announcement, the team will play as the Los Angeles Chargers starting in the 2017 season at StubHub Center in Carson, California, despite the fact that the stadium seats well below the 50,000 minimum that the NFL set even for temporary homes following the 1970 merger. There had been speculation that the team may rebrand itself similar to how the Houston Oilers ultimately became the Tennessee Titans in 1999. 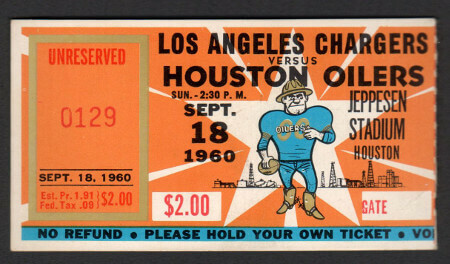 Unlike the situation between the Cleveland Browns and Baltimore Ravens, the Oilers’ rebranding was done by the team’s choice and not by court order. The Chargers, however, announced they had no immediate plans to rebrand after the relocation. The Los Angeles Chargers are a professional American football team based in the Los Angeles metropolitan area. The Chargers compete in the National Football League (NFL) as a member club of the league's American Football Conference (AFC) West division. The club began play in 1960 as a charter member of the American Football League (AFL), and spent its first season in Los Angeles, before moving to San Diego in 1961. The Chargers joined the NFL as result of the AFL–NFL merger in 1970, and played their home games at Qualcomm Stadium. The Chargers had been the only NFL team based in Southern California since the Raiders and Rams moved out of Los Angeles in 1994. A return to Los Angeles was announced for the 2017 season, just one year after the Rams had moved back themselves. The Chargers will play their home games at the StubHub Center until the opening of the Los Angeles Stadium at Hollywood Park in 2019, which they will share with the Rams. Who is the greatest Los Angeles Chargers? The Los Angeles Chargers are a professional American football team based in the Los Angeles metropolitan area.